Century Communities’ Sale of the Century includes Rhodes Ranch in southwest Las Vegas. 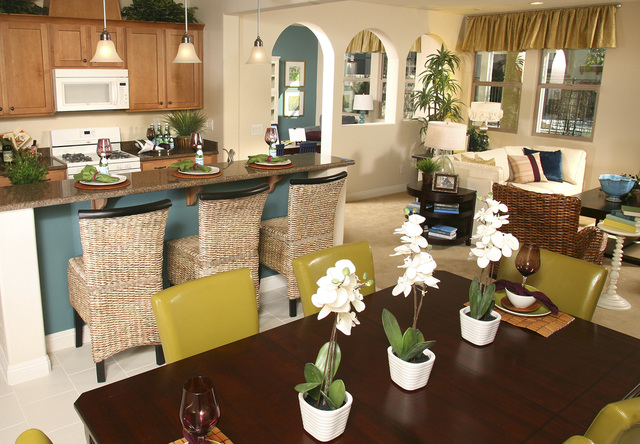 Courtesy photo The kitchen, dining area and kitchen nook of the Monterey 2229 model home at Century Communities’ Rhodes Ranch master plan. Among the move-in ready homes available at Rhodes Ranch is a two-story Monterey 1751 plan. This home includes three bedrooms, 2½ baths, a great room, formal dining room and two-car garage with bonus storage space. “Many of our move-in ready homes include upgraded cabinetry, flooring, appliances and covered patios,” Jones said. During Century Communities’ Sale of the Century, homebuyers at all three of its Southern Nevada collections can get up to $20,000 or more applied toward upgrades, closing costs and special financing options for move-in ready homes, he said. Two guard-gated entrances greet residents on both the west and east sides of Rhodes Ranch, making entering and exiting convenient. Major nearby roadways including the 215 Beltway provide quick access to the valley’s major education and employment centers as well as McCarran International Airport and the Strip. Rhodes Ranch has a recreation center, Fun Zone Water Park, the only one of its kind in Southern Nevada and available exclusively to Rhodes Ranch residents and their guests. The Fun Zone joins a 25-meter lap pool, two eight-person spas, a 12-person spa, four large covered cabanas, an exterior lighted basketball court, two sand volleyball courts, four lighted tennis courts and a children’s playground with activity structures. The 18-hole championship Rhodes Ranch golf course is masterfully designed by renowned architect Ted Robinson Sr. and surrounded by lush, tropical landscaping. All Century Communities homes in Southern Nevada are Energy Star certified and built with standard features such as paved driveways and walkways, kitchen cooking islands, countertops and maple cabinetry, Whirlpool appliances and Moen chrome faucets. Century Communities Southern Nevada sales offices are open from 10 a.m. to 5 p.m. daily. For more information, visit www.centurycommunities.com or call 702-740-4111.